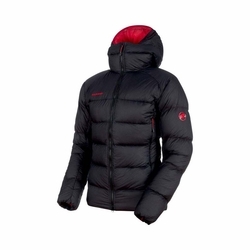 Mammut Meron IN Hooded Jacket. It won't let you down in the mountains: the Meron IN Hooded Jacket Men is made of an extremely lightweight Toray ripstop material that reliably repels water. Practical for via ferrata in the mountains: the jacket features a helmet-compatible hood along with backpack- and climbing harness-compatible pockets. It also boasts an ultra-lightweight, semi-transparent lining. The goose down and feather filling keeps you warm in cold temperatures.